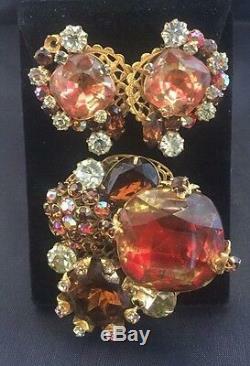 VINTAGE ORIGINAL BY ROBERT HIGH END CLUSTER RHINESTONE BROOCH CLIP EARRING SET. Pair of earrings are signed. Earrings are clip on and measure 1 1/4" x 1" wide. One of the earrings is missing 1 stone, see pics. The brooch measures 2" x 2". MY PHOTOS ARE PART OF THE CONDITION REPORT, SO REVIEW CAREFULLY. MOST OF MY ITEMS ARE FROM ESTATES AND AUCTIONS, THEY ARE NOT NEW. PLEASE NOTE: Most of the Items that I sell are used, unless otherwise specified. I do my best to describe my items as accurately as possible. If you feel that I have misrepresented an item that you have bought, please contact me BEFORE leaving feedback and I will do whatever I can to work with you. As you can see in my feedback, I try to the best of my ability to have 100% satisfied customers. Customer service is my Top Priority. I try to describe the item as best I can and take as many photos as possible. 5 star feedback is my goal and very important to me! New items are listed weekly! ABOUT US: Bingham's Antiques is located at 12801 Larchmere Blvd. In the heart of Shaker Heights, OH Antique District. We are a very active shop with new items arriving each week. Our retail hours are Thursday-Saturday 12-4 or by appt. PLEASE NOTE: IF YOU WANT TO VIEW AN ITEM IN OUR STORE, CALL FIRST TO BE SURE IT IS THERE! MANY ITEMS ARE IN OUR WAREHOUSE. The item "VINTAGE ORIGINAL BY ROBERT HIGH END CLUSTER RHINESTONE BROOCH CLIP EARRING SET" is in sale since Friday, June 3, 2016. This item is in the category "Jewelry & Watches\Vintage & Antique Jewelry\Costume\Designer, Signed\Sets". The seller is "jpc1016" and is located in Cleveland, Ohio. This item can be shipped to United States, Canada, United Kingdom, Denmark, Romania, Slovakia, Bulgaria, Czech republic, Finland, Hungary, Latvia, Lithuania, Malta, Estonia, Australia, Greece, Portugal, Cyprus, Slovenia, Japan, China, Sweden, South Korea, Indonesia, Taiwan, South africa, Thailand, Belgium, France, Hong Kong, Ireland, Netherlands, Poland, Spain, Italy, Germany, Austria, Israel, Mexico, New Zealand, Philippines, Singapore, Norway, Saudi arabia, Ukraine, United arab emirates, Qatar, Kuwait, Bahrain, Croatia, Malaysia, Brazil, Chile, Colombia, Costa rica, Panama, Trinidad and tobago, Guatemala, El salvador, Honduras, Jamaica, Bahamas, Viet nam.